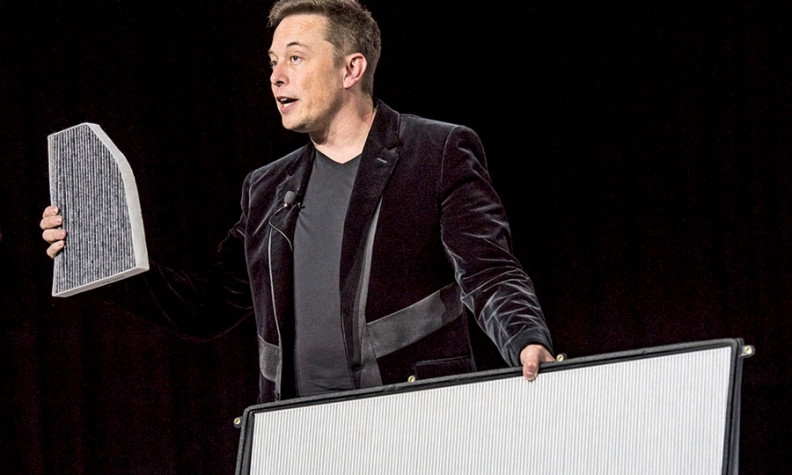 Elon Musk, CEO of Tesla Motors, unveils the Model X during an event in Fremont, Calif. Musk handed over the first six SUVs to owners in California. FREMONT, Calif. -- When most companies conceive a car, the designers shoot for the moon and the engineers bring them down to Earth. 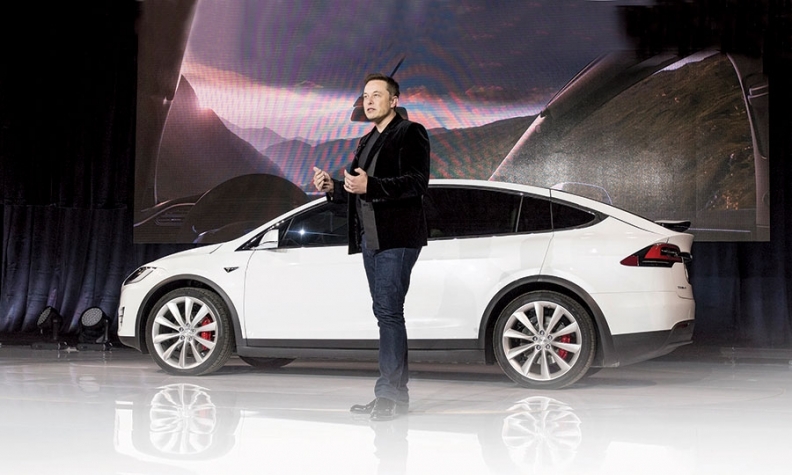 Elon Musk, the space-travel mogul and CEO of Tesla Motors Inc., wasn't having that with his Model X.
Musk's all-electric three-row crossover finally saw the light of day last week, 3 1/2 years after he unveiled a prototype. At a splashy event here attended by thousands of customers, Tesla delivered the first few units of the Model X to a select group of investors and showed off features that include falcon-wing doors, a sky-view windshield and an enormous air filter with a maxed-out option that Musk dubbed "bioweapon defense mode." Had he known how difficult the engineering on these features would be, Musk told reporters before the unveiling, he might have reined in his ambitions. "I think we got a little carried away," Musk said. "In retrospect, we would not have done so much in the way of features and functionality for the X," he added. "People are going to get an incredible car that does so many things that no other car does, but it didn't need to do quite as many things." This offers a valuable lesson about simplicity for Tesla, which intends to use cash flow from sales of the Model X to fund Musk's true automotive moonshot: the smaller and less expensive Model 3, due in late 2017 at a starting price around $35,000. But for now, Tesla can offer a list of outlandish features for the Model X -- and hope that its loyal customers, many of whom long ago plopped down deposits of $5,000 to $40,000 for the right to buy a car someday, consider those features to have been worth the wait. The upward-opening doors of the Model X can be operated using traditional buttons or the 17-inch touch screen on the dashboard. 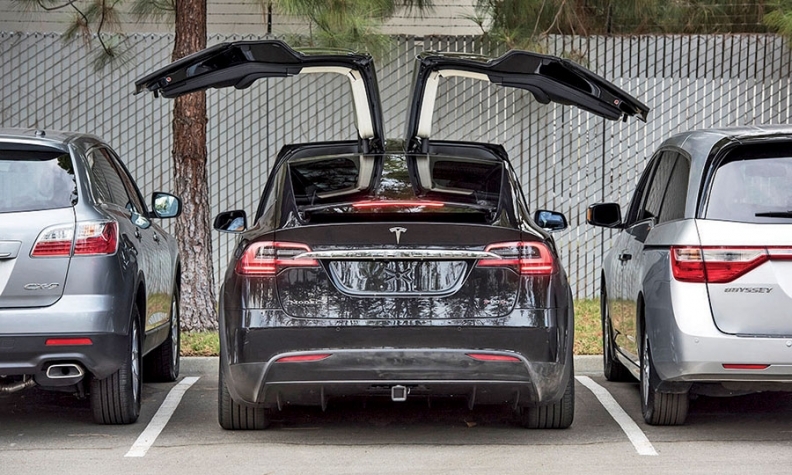 Park in a narrow space between two cars or in a low-ceiling garage, and the Model X gauges distance using ultrasonic sensors to calculate a safe trajectory and open the doors as wide as possible. Tesla insists the double-hinged doors are not mere eye candy, but a practical improvement over a minivan’s sliding doors. The accountants who monitor Tesla’s warranty costs, though, must be feeling a bit of trepidation. 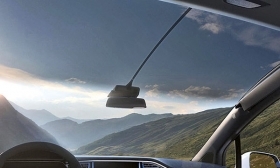 The windshield in the Model X offers a wide-open view of the sky. To prevent the cabin from becoming too hot and bright on sunny days, Tesla tinted the glass with a gradient from clear to black. The sun visors fold in half and nest along the A-pillars; extend them over the windshield, and they lock magnetically to the rearview mirror mounted in the middle of the glass. 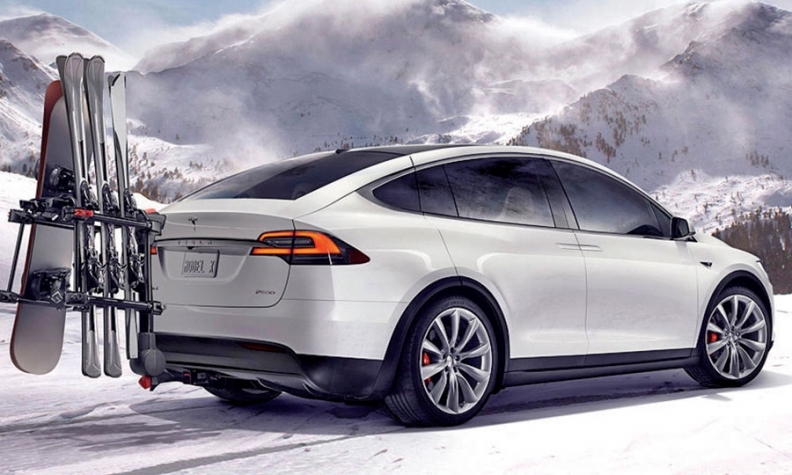 With all of the boxes checked, the basic Model X 70D tops out around $100,000. Tesla designed the Model X to tow up to 5,000 pounds, which it demonstrated by hauling an Airstream trailer during last week’s unveiling. With an optional rear-mounted rack — so easy to install that Tesla assigned one of Musk’s young sons to attach it onstage in a matter of seconds — Model X owners will be able to carry four bikes or six pairs of skis without losing access to the trunk. 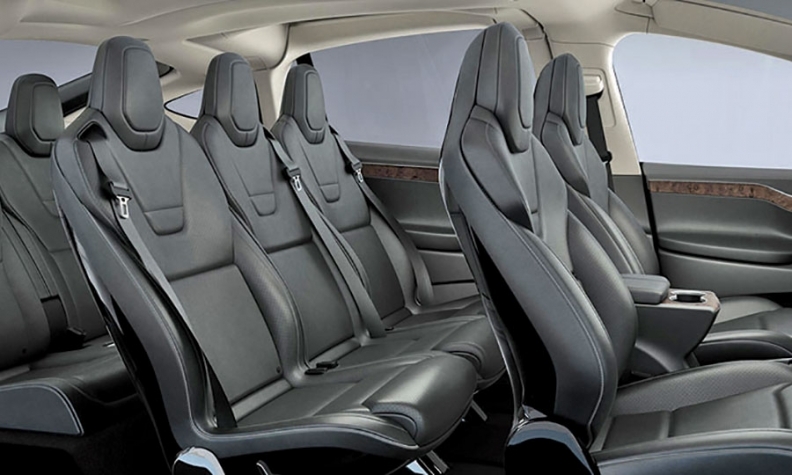 Tesla designed the slim, curvaceous second-row seats on shiny individual posts that allow them to move independently from one another. The seat belts are integrated into the seats for a futuristic look. The seats also move forward and backward with the press of a shoulder-mounted button, making it simple to climb into the way back. At a moment when the talk of the auto industry is air quality — ahem, Volkswagen —Tesla highlighted the enormous air filter hidden behind the dashboard of the Model X, which Musk touted as offering “hospital-level air quality.” To make his point about the filter, touted as being five to 10 times larger than standard air filters for cars, Tesla designed the Model X’s climate controls with a setting for “bioweapon defense mode,” cranking the air filter into overdrive for maximum air quality.